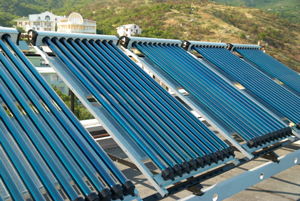 Solar thermal collectors collect heat using liquid or air. The heat is transferred to a large water tank, which can then be used to heat water for washing and for space heating. The sun is the most powerful source of energy we have. The sun's heat generates our planet's weather patterns and ocean currents. Even though the earth absorbs only about half of the solar radiation that reaches its surface, the amount of solar energy absorbed in just a few hours is more energy than the world's human population uses all year long! Do you currently have a solar heating system, or are you interested in installing one? Dr. Energy Saver dealers are skilled at helping homeowners achieve their heating goals, whether they are in need of repairs or a new system. We also make sure to install efficient systems that can save you money on utilities. To see if your home can take advantage of solar energy as a heat source, get in touch with your local Dr. Energy Saver and schedule a home energy audit! Humans have been relying on solar energy for thousands of years. Long before central heating systems were developed, early builders learned to orient homes and other structures to capture the sun's warmth. Many of these "passive solar" design principles are still in use today. In addition to taking advantage of solar energy with passive solar heating features, it's also possible to warm buildings using "active solar" systems. As the name suggests, active solar systems require energy (usually in the form of electricity) to utilize the sun's heat. Air-based active solar. Perhaps the simplest type of active solar heating system is an air-based system that distributes solar-heated air throughout the living space using fans. The collection point for solar-heated air might be an attached sunspace, a living room or even a hallway that has good solar exposure and insulated glass to admit plenty of sunlight. The fans used to distribute hot air can be manually or automatically operated. Solar thermal. In this type of system, water or an antifreeze solution is warmed by the sun in a solar collector that can be mounted on the roof or on the ground. When the liquid in the collector reaches a certain temperature, it is pumped to a storage tank or to a heat exchanger that heats water. Depending on how the system is designed, the warmed fluid can be pumped through tubing in a radiant floor heating system or to an air handler in a hydro-air system. Backup heating required. Whether a house utilizes an air-based active solar heating system or a solar thermal heating system, some form of backup heating system is necessary. Otherwise, building inhabitants will be very cold at night and during overcast weather. Sunshine, insulated glass, and dark flooring. There are a few features to keep in mind to ensure optimal passive solar heating. For starters, the house needs to have a generous amount of insulated glass that faces south to admit sunlight into the interior of the structure. Secondly, it's good to have a dark-toned floor or wall that will get direct sunlight for an extended period of time. Masonry floors and brick walls are good examples of "thermal mass" that can absorb a good amount of heat - and then release it gradually after the sun goes down. Don't forget shading. The same sunlight that's welcome inside the house during cold weather can be a curse on hot summer days. That's why it's essential to incorporate shading details in any passive solar design. Awnings, roof overhangs, and exterior shutters are popular devices to limit the amount of summer sun that warms the house. Is your house a candidate for solar heating? How can you tell if your house is optimized for solar heating? Sometimes a good solar orientation is obvious. In other cases, a less ideal solar exposure can sometimes be improved by trimming back or taking down trees. To get a professional assessment of your home's potential for solar heating, it's best to confer with a home energy specialist or a contractor who specializes in solar installations. Whether your home has a good solar orientation or not, you'll be able to find an affordable, efficient method of heating your home. Dr. Energy Saver can help install or repair a solar heating system and much more - click below to schedule a home energy audit with your local dealer!